Cradled by the Blue Ridge and the Allegheny Mountains, Virginia’s 140-mile Shenandoah Valley is laced with some of the most spectacular thoroughfares in state. One of the most historic corridors in Virginia, the valley features everything from colonial-era towns to Civil War battlefields, providing a portal to some of the state’s best outdoor recreational opportunities and access to the Shenandoah National Park, the George Washington National Forest, and the Shenandoah River. Today’s Shenandoah Valley is a diverse place, sprinkled with charming towns, wineries, craft breweries, and infinite outdoor adventures. So load up the car and explore Virginia’s most stunning landscapes with one of these epic road trips. One of the most spectacular motorways in America, the 469-mile Blue Ridge Parkway runs through mountainous corridors of Virginia and North Carolina, linking the Shenandoah National Park with the Great Smoky Mountains National Park. The Shenandoah Valley’s portion of the parkway stretches between Waynesboro and Natural Bridge, and includes a number of iconic highlights. Stock up for your tour at the Cheese Shop in Stuarts Draft—and then hit the parkway. 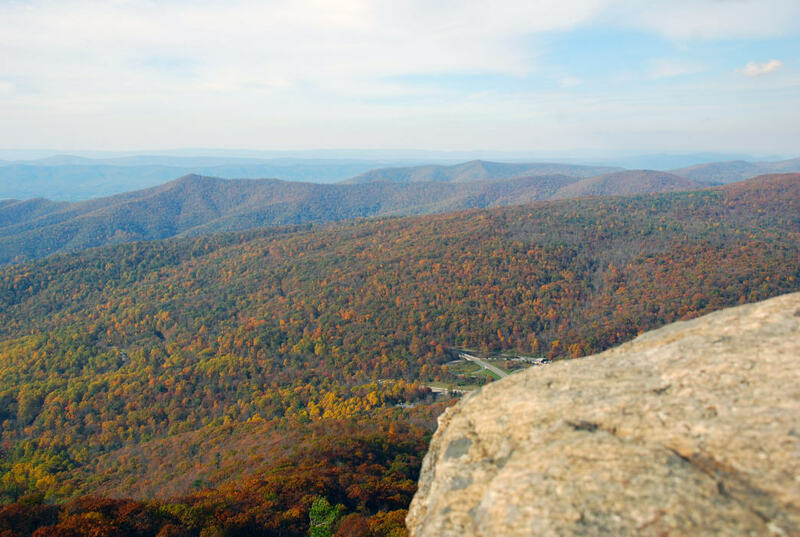 South of the Waynesboro, visit the Humpback Rocks Recreation Area (milepost 5.8). Tackle the quad-burning, mile-long ascent of Humpback Rocks for sweeping views of the northern Blue Ridge from atop the 3,080-foot greenstone pinnacle. Next, continue to one of the parkway’s gems—the sandy swimming beach at 25-acre Sherando Lake. Cap off the day with a wine tasting at any of the vineyards around the parkway’s northern entrance, like Barren Ridge Vineyards, in Fishersville, or the Ox-Eye Vineyards in downtown Staunton. Take in the view from 3,514 feet at Mary’s Rock. Bisecting the 200,000-acre Shenandoah National Park, Skyline Drive showcases one of Virginia’s most spectacular natural wonders. The 105-mile roadway features endless Blue Ridge panoramas, including 75 scenic overlooks. Stop the car and you’ll find more than 500 miles of hiking trails to explore on foot. Chances are good that you’ll spot some of the park’s resident wildlife—black bears, red fox, coyotes, and more than 190 different birds—that regularly appears near the roadway. Hop on Skyline Drive at the park’s northern entrance, just outside Front Royal, and head south. For a quick, 2.6-mile out-and-back hike to one of the park’s most iconic vistas, stop along the first third of the drive, at the Meadow Spring Trailhead (milepost 33.5), and head for 3,514-foot Mary’s Rock, a panoramic promontory scalable by linking the Meadow Spring Trail and the Appalachian Trail. Next, stop near the drive’s halfway point, at Big Meadows (milepost 51). Stretch the legs with a short loop around the deer-grazed lea, and then grab lunch at the New Market Taproom inside the Big Meadows Lodge. End the day in Waynesboro, just 5-miles from Skyline Drive’s southern terminus. The town is home to three of the breweries along the Shenandoah Beerwerks Trail—Basic City Beer, Seven Arrows Brewing Company, and Stable Craft Brewing. Running from Winchester south to Roanoke, Route 11 meanders through the heart of the Shenandoah Valley parallel to Interstate 81 linking charming towns and natural wonders. The roadway is one of the most historic thoroughfares in Virginia: It began as a hoof-forged pathway used by migrating bison and the Native American hunting parties in pursuit of the lumbering herds. In the 18th century, the thoroughfare was dubbed the Wilderness Road, and used by audacious settlers striking out for the frontier from cities across the East Coast. For the ultimate Route 11 road trip cruise the 50-miles from Natural Bridge to Staunton. Begin at Natural Bridge State Park and hike to the recreation area’s namesake 215-foot sandstone—making sure to tack on a trip to 30-foot Lace Falls on the Cedar Creek Trail. Next, head to Lexington. The college town features a charming Main Street, loaded with farm-to-table restaurants, boutiques, and galleries. It’s also home to attractions like the Stonewall Jackson House, the Miller’s House Museum, or Virginia Gold Orchard, which specializes in Asian pears. Grab lunch at the vegan-friendly Kind Roots Café, offering an array of gourmet sandwiches and smoothies. On the way out of town, head for the award-winning Devil’s Backbone Brewery, located directly on Route 11. Cap off the day in Staunton, exploring the town’s collection of closely concentrated breweries – Shenandoah Valley Brewing Company, Redbeard Brewing Company, and Queen City Brewing. Stop at the Goshen Pass Natural Area Preserve for an eyeful of the breathtaking gorge. Route 39, aptly dubbed the Appalachian Waters Scenic Byway, links five counties in Virginia and West Virginia, extending from Lexington westward to Summersville, West Virginia. In Rockbridge County, the roadway showcases a picturesque corner of the Shenandoah Valley, paralleling one of the best whitewater rivers in the state—the Maury. Pick up grab-and-go picnic fixins at Blue Phoenix Café in Lexington before hitting the road. Make the first detour at the world renowned Virginia Horse Center, just outside town. The 600-acre facility is a pivotal part of the state’s equine economy, and hosts 115 different events annually, the majority free and open to the public. Next, head for the highlight of the 23-mile stretch between Lexington and Goshen—a stunning 3.7-mile gorge carved by the roaring Maury River dubbed Goshen Pass. Stop at the Goshen Pass Natural Area Preserve for an eyeful of the breathtaking gorge. The 937-acre natural area is woven with hiking trails, including riverine routes ideal for scoping out tranquil swimming holes. The area is best accessed via the swinging bridge over the Maury River next to the parking area along Route 39. End the road trip with a wine tasting at beautiful Rockbridge Vineyards in Raphine. Head for the 1,600-acre Shenandoah River State Park in Bentonville along the Daughter of the Stars Loop. Paddlers already anxious to hit the water can pick from over a dozen public river access sites around Front Royal, like Eastham Park, which also features multi-use trails and a dog park. Unequipped paddlers can rent boats, tubes, or arrange shuttles through the town’s outfitters: Down River Canoe Company, Front Royal Outdoors, or Skyline Canoe Company. 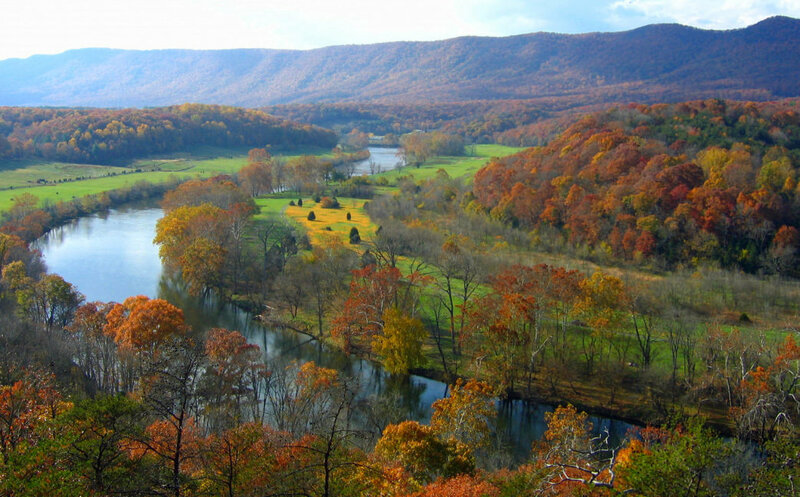 Or head for the Shenandoah River State Park in Bentonville. Want to see the beauty from a different perspective? Then stop at Virginia Canopy Tours where you can fly through the forest reaching speeds up to 40 mph and soar at heights ranging from 15 to 90 feet above the forest floor. 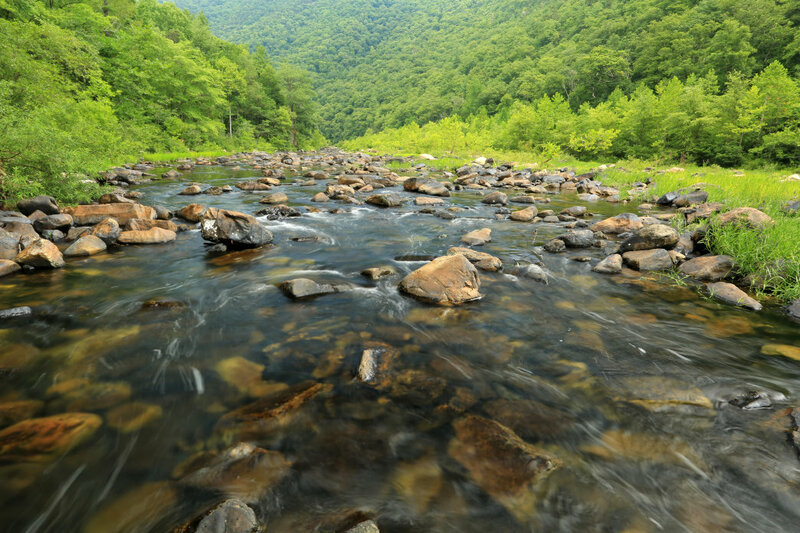 The 1,600-acre recreation area is bisected by a stunning stretch of the South Fork of the Shenandoah River. It also features 24 miles of trails, including the wildflower-studded Bluebell Trail. Explore the Shenandoah Valley’s vast network of subterranean wonders at Luray Caverns, the largest series of caves in the eastern United States. When it’s time to recuperate at the end of the day—choose from whiskey, wine, or craft beer via the Shenandoah Spirits Trail. In Luray, swing by the River Hill Distillery (open for tastings Saturday), producing aged bourbon whiskey, or opt for locally sourced beers at Hawksbill Brewing Company. Rather sip a fine wine? Continue toward Mt. Jackson and detour to one of the area’s many vineyards including Cave Ridge Vineyard, Winery at Kindred Pointe, Third Hill Winery and Wolf Gap Vineyards. Originally written by RootsRated for Staunton.